Hi there full moon followers! This is the latest full moon report for 14 November 2016. The largest Supermoon in 69 years apparently! This means that the lunar charge and influence will be at its strongest in many a time. Soooo we have the Sun in Scorpio opposite the Moon in Taurus at 22º. This is a match up of the deepness of Scorpio, a deep fixed watery chalice offering transformation (that’s good or bad, take your chance haha!) and the earthy fixed indulgence of Taurus. Deep water and fixed earth can often lead to mud. This is no time to get stuck in the etheric mud. Grounding is important, which will help the stubborn ground that won’t give way some help in accepting the polar opposite of Scorpio. Thank goodness that Mercury has just moved out of Scorpio and into Sagittarius. Scorpio wants to tell it how it is (how Scorpio sees it, which can be quite acidic at times), Sagittarius wants the truth through learning and experience. With Venus and Mars early into spells in Capricorn and Aquarius respectively, there is a changing of energy in the air of the full moon. Capricorn will help ground that love, whilst Mars is a little unpredictable in Aquarius. 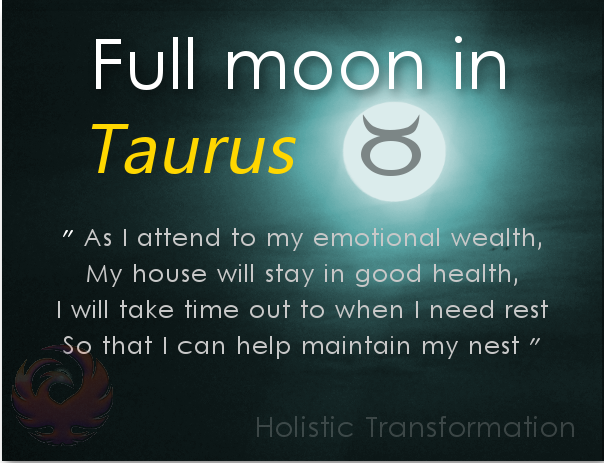 The moon represents challenges to the emotional self and when Full and in Taurus reminds us to feel good! Not in an spacey, drunky, floaty good time way- but being real and appreciative of the good things in life- and that they can be luxurious and not expensive at the same time. The material self is challenged in somewhat stubborn Taurus, challenging you to be find comfort in yourself and your own means, to be true to yourself and be doing what’s right for you whilst also not being selfish and too self-obsessed. For these days (the three of the full moon halo) make sure you are tending to you. Make sure that you are feeling emotionally well, safe and secure. From this safety, you can use the will of the scorpion and snake (Scorpio) to start the transformation. This is a time of great healing upon the earth, the need to feel secure and one with the body is great. We have time now to set the base, whether in a physical space or purely in the body, the self. From this base, we can launch our new projects and bring about great change. Scorpio and Taurus are in fact a gift for this. Until next time, happy Full Moon!